Until now, Broadlink SP1 was the cheapest ($32) Wi-Fi smart socket I found. It supports Australian and Chinese plugs, and Android and iOS smartphones. The two main downsides is that the application is in Chinese by default (English can be installed via a firmware upgrade), and although the top of the socket support international plugs, the plug of the device only support Australian / Chinese standard, and you may need an adapter to connect the device to your wall socket. There’s now a similarly priced option in Kickstarter called Plugaway that supports Australia, China, Euro, U.K. or U.S. standards, can measure power consumption, dim lights, and comes with Android and iOS apps, with Windows planned for a future release. Power consumption – 0.2W for prototype. Plug types – Type-F, Type-I, Type-G, & Type-B plugs – Click here to know the type of plug used in your country. For example, none of this types of plug are supported in France. Although it may be quite important, the maximum output current does not seem to be mentioned at all, and temperature range is not indicated either, but should not be an issue if your plugs are indoor. Once you connect your Plugaway, configure the phone app appears to be straightforward. The app will detect your smart socket, you give it a meaning name, e.g. water heater, and you’re ready to turn it on/off. Device alerts and notifications – Useful if you forget to turn off the light, or if your fridge breaks down. The app can also be personalized with your name, colors, mood, etc… Devices can be controlled from your LAN and the Internet. 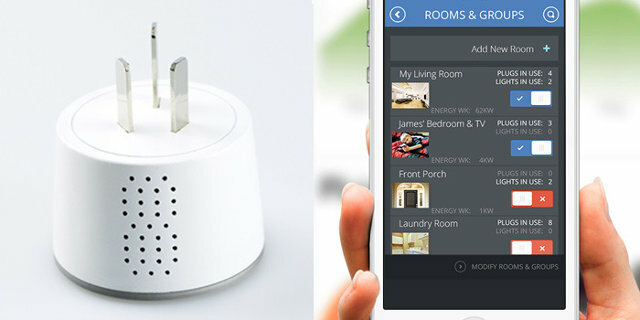 The company (Torrap) will also make their smart sockets compatible with other home automation frameworks or devices supporting Wi-Fi such as Ninja Sphere and Belkin Wemo. A developers corners will open www.plugaway.co, allowing sharing of themes, skins, moods, actions and firmware. Both the app and firmware will be open source once the products ship. If you’re a company, hotel or retail chain, this will allow you to easily customize the user interface. You can pledge $30 AUD (~$27 US) for a Plugaway smart socket, adding 10 AUD for shipping if you live outside of Australia. The company also feature a smart LED bulb for $45 AUD which is not a popular. Other pledge with several smart plug and/or LED bulbs bundles are also available. Shipping is scheduled for April 2014.